The women grumble under their breath, but I hear them. They wish they hadn’t come. I realize the situation is bleak, and but for a moment I too wonder what we’re doing here. Then, atop this precipice where I write, I peer to the west, and I can see it: the ruins of the ancient stronghold, hollowed out of a southern point of The Violent Walls mountain range. The fulfillment of my destiny is almost within my grasp! Vudthardatan, called “Ransackediron” in the Humans’ crude tongue, lies before me, the first fortress ever constructed by my glorious civilization Nidostdegel, “The Ferocious Galley.” It was a small band of dwarves calling themselves The Tired Arrow who struck the earth here, and on that day our realm started and the Record began. For the next twenty eight years my ancestors flourished in the city, until it was laid waste in the Rampage of Siga Gravefatal, the Shadow-shaft of Caves. That great beast, forgotten for over 500 years, has slumbered there ever since, burrowed deep in the bowels of the fortress, and none have dared approach its crumbled walls. Siga has appeared in my dreams more times than I can count, and each time I slew him with an axe cast in the heat of the same magma sea that once fired the ancient forges of Vudthardatan. But these are not just dreams, they are visions, sent to me from Rimtar god of Fortresses, for I am destined to reclaim our very first home! Alas, only a scant few believe in me, so I don’t have the force with which to launch an assault yet. Thus my small band of loyal followers and I will create an outpost here, and grow stronger, perhaps drawing more support once others realize we are called to greatness. Maybe even Siga himself will see our might from his lair deep below, and emerge on his own to try to thwart our plans before they can come to fruition. I say let him! I will meet him on the battlefield and take off his head just as I have dozens of times before! This truly is the Age of Heroes, and I intend to carve my name in its Memorial Wall of Legends! Back home they laughed at me – all of them. Not a single male would join my cause. So be it. I brought with me six strong she-dwarves, and together we will vanquish the foe and restore glory to Vudthardatan. Stodir, our eldest and strongest, is ready to strike the earth for the cause, but she believes she saw platinum in the mountains here. I’ve told her to wait its extraction, lest we draw the attention of marauding kobolds and goblins. There will be plenty of time to flaunt our wealth once we have settled in. In the meantime, I have sketched out a plan for her to mine out a small area of the hill for a temporary dwelling until the summer. Then we begin work on a water cistern deep below the ground where we can keep it from freezing – and so that we do not die of thirst. We brought with us dogs that we could train as basic guards, but the crafter Adil has offered to take measures to automate our protection from intruders with elaborate traps she has personally designed. I hope she finds the proper stones for which to carve the mechanisms she needs to accomplish this. Ushat our Farmer has brought seeds to start cave plants for our underground farm, but I hope we can find more surface crops to harvest during a thaw. I would rather brew plump helmet mushrooms into a fine drink than eat them. Olin, ever faithful friend, will cook and brew our crops for us until they run out. May that day never come, for her Dwarven Wine is like no other. Hopefully we can find game about these mountains to sustain us with meat and fill our bellies with Olin’s wonderful stews. Which brings me to Lokum, our hunter, who usurped me and became Expedition Leader on the day we embarked. As adequate as she may be, I do doubt her abilities to guide us any further now that we are here. Already I’ve chastised her for bringing the anvil instead of more food. (I hadn’t noticed it in the wagon all this time.) We argued in front of everyone: she saying the anvil will be needed for the future smith, I saying meat first, she countering with her hunting skills… it went on for a long time. In the end, I accused her of ignoring my wishes from the supply list; she could only feebly claim they all thought I was dead on the day we left, which is why they packed and left without me. Ridiculous, of course, for everyone knows I am a deep sleeper. I believe they wish to create a name for she-dwarfkind by taking my destiny away from me and basking in it themselves. I will be watching them all, but Lokum the closest. So of the seven of us, that leaves myself, Stakud, who will carve the stone for the glory of this place. The women have allowed me to name it Cilobaval, “Roofloves,” in honor of my long departed wife. I feel as if she is with me already. Tonight I will engrave images into our first mined wall to spur the hopes of us all. May Rimtar inspire me as I work the rock. And Siga, take heed: your days are now numbered. For a breakdown of the actual gameplay, read on here. If you enjoyed this, perhaps you might enjoy my original novel, By the Light of the Moons, available for download on Amazon Kindle. Best of luck mate, the last time I tried to reclaim a fortress, all seven of my dwarves received a happy helping of dragon breath. 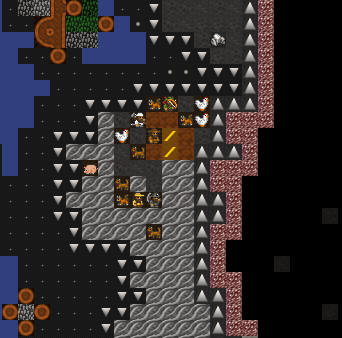 Nothing more entertaining then melting dwarves, cooked in their own iron armor.